Survivors of the St. Francis Dam disaster recall the dam's fatal collapse 75 years ago. 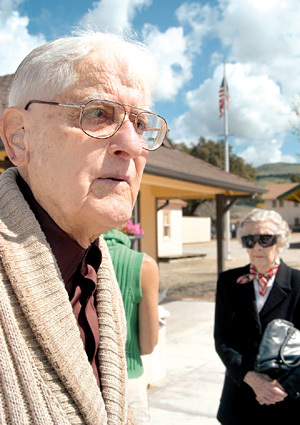 Nobert Duarte and his sister, May Caldwell, await the "survivor train" to take them from Fillmore to Santa Paula for a 75th anniversary rememberance of the St. Francis Dam disaster. The week-long remembrances of the St. Francis Dam disaster came to an emotional end Sunday as survivors of the March 12, 1928, tragedy witnessed the unveiling of a bronze statue commemorating both the tragedy and the heroism which occurred that unforgettable night. A group boarded a "survivor train" in Fillmore, then headed up to Santa Paula where a life-size bronze sculpture titled "The Warning" was showcased. The sculpture, located on the corner of 10th and Santa Barbara streets in Santa Paula, depicts two motorcycle police officers warning residents of the impending disaster. Two survivors from that tragic night were among some 50 who attended the event. Nobert Duarte, then 14, and his sister May Caldwell, then 8, remember that night 75 years ago as if it were yesterday. They recalled the evening when, just before midnight, their cousin, who worked by the dam, knocked on the door and warned the family of the inevitable. "He begged and he pleaded with my mom to call our neighbors in the canyon," Duarte said. "He told her the dam was going to go. When my mom called the family that lived in our neighborhood, the phone lines were already down." To Duarte, losing their neighbors was the most difficult thing to accept. "The first thing that came to my mind was the loss of this family," Duarte said. "They were such wonderful, happy people. They never harmed anybody. Everybody loved them and the thing that struck me the most was that we would never see these people again." But Caldwell said the one thing that stood out the most that night was the what she heard. "The noise was the first thing I'll never forget," Caldwell said with tears in her eyes. "You couldn't tell what was going on. It was just horrible. After about two hours, it was just silent. No electricity, no nothing. We were told to get up to higher ground. My father then went down to help the people in the canyon." Duarte, who went on to a 33-year career in education and now lives in Valencia, said he hopes students become more informed about the disaster. "I think it's a pity that youngsters don't know about this tragedy," he said. "This is something that I can't understand. This is the second greatest tragedy in the state of California, first being the San Francisco earthquake. And I can't understand why history hasn't given this flood and the failure of this dam more play." The dam was built under the direction of William Mulholland. Its collapse is believed to have been caused by its construction against an undetected prehistoric landslide. Water undermined the rock structure, which resulted in the total collapse of the dam. Webmaster's Note: "Nobert" is the correct spelling (not Norbert).